Ett inlägg delat av badgalriri (@badgalriri) 26 Dec 2017 kl…. in commercially sold beauty products. Welcome to Ultimate-Rihannas.com, your ultimate source for Rihanna! Our page is updated daily with the latest topics, videos, photos and more. Started in 2005 and still running! Ultimate Rihanna is a fansite. We have no association with Rihanna, her management or any of her associates. Leading role - "Nine Ball"
Where do you want to enjoy Rihanna's music? 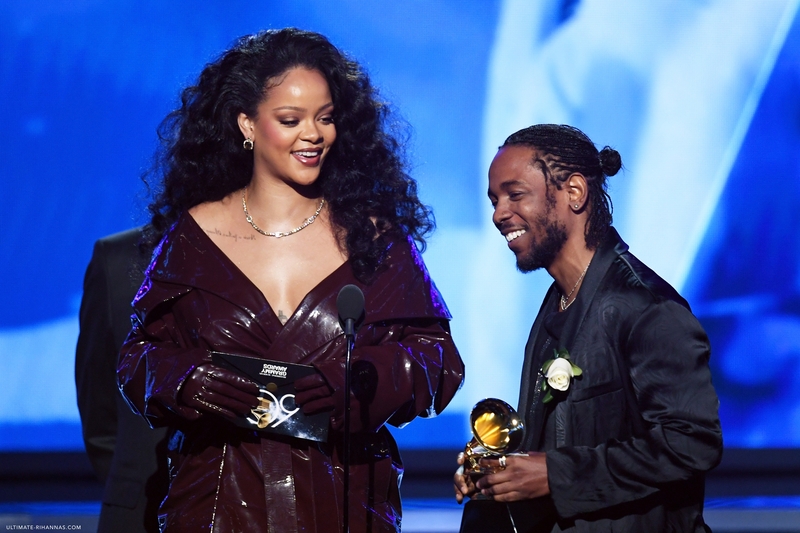 Rihanna and Kendrick Lamar took home the Grammy Award for Best Rap/Sung Performance with “Loyalty” during the 60th Annual Grammy Awards last night (Jan 28th). This marks Rihanna’s 9th Grammy Award ever since 2008, where she won her first ever Grammy with “Umbrella” in the same category. Rihanna, DJ Khaled and Bryson Tiller also took the stage for a sultry performance of “Wild Thoughts”. The performance had a fun, frisky energy as Rihanna and Tiller navigated a stage full of frozen, statue-like backing dancers, who burst loose at the sound of the chorus. Rihanna looked particularly stunning in a sparkly magenta dress and matching flower in her hair. Unfortunately Rihanna didn’t walk the red carpet this year, but nevertheless there are lots of photos of her performance, speech and backstage photos in our gallery! Videos of the night after the jump! Posted by An.J / Filed under: Award Shows, Performances / Leave a comment? By request we’ve made HD screen captures of Rihanna’s “Kiss It Better” performance at the 2016 Made In America Festival. We’ve also thrown in a few gifs, check it all out in our gallery and after the jump! Posted by An.J / Filed under: anti, Anti World Tour, Performances / Leave a comment? Rihanna joined Sir Paul McCartney during his set at the second weekend of Desert Trip last night (Oct 15rh). The festival, which is organised by the team behind Coachella and takes place at the same location in Indio, California, has been dubbed “Oldchella” because its line-up features some of rock’s elders. “We finally found someone under 50” McCartney is said to have joked, as Rihanna joined him to perform ‘FourFiveSeconds’. Watch a video above. Posted by An.J / Filed under: News, Performances / Leave a comment? Rihanna ran through her pop and R&B hits at the fifth annual Global Citizen Festival on Saturday (Sep 24th). She closed the show with a number of her smash hits, from “We Found Love” to “Umbrella” to the recent “Needed Me.” Most of the performers thanked the feverish audience for doing acts of kindness to earn the tickets. As fans waited for Rihanna to perform, Chris Martin — who had just performed — came back onstage to stall. He sang Prince’s “Raspberry Beret” while strumming the guitar, and freestyled new lyrics about why Rihanna was late, which earned laughs and applause from the crowd. He joked that the singer was doing her makeup and said he would perform the Prince song again. A day before the festival, on Friday, Rihanna was appointed Ambassador of Global Citizen, which teamed up with her Clara Lionel Foundation for a multi-year partnership to advocate for kids. Julia Gillard, the chairwoman of the organisation, took to the mic to cement the partnership, telling the world that “education is the best investment we can make for a prosperous, peaceful, equitable and future-ready world”, and that she was “thrilled” be working with Rihanna. Watch two videos of Rihanna’s performance after the jump, as well as Chris Martin’s freestyle and Rihanna using a cute Snapchat filter. Posted by An.J / Filed under: Anti World Tour, Charity, Clara Lionel Foundation, News, Performances / Leave a comment? Posted by An.J / Filed under: Appearances, Candids, News, Performances / Leave a comment? Tens of thousands of fans who spilled onto the Benjamin Franklin Parkway during Budweiser’s Made in America music festival came to see Rihanna on Saturday, the highly anticipated Barbadian singer who, just last week, was awarded a lifetime achievement award from MTV. Rihanna delivered an amazing performance as usual, giving the crowds an ANTI World Tour experience during her first ever Made In America performance. While we wait for Tidal to add the entire performance, check out photos in our gallery. Posted by An.J / Filed under: Anti World Tour, Concerts, News, Performances / Leave a comment? Earlier in the evening on Wednesday (Aug 31st) Rihanna joined Drake on stage for “Work”, as well as a few of her own songs. While in Miami, Rihanna also decided to get new ink. She was tattooed by her favorite artist Bang Bang, who just revealed Rihanna’s new body art: a shark. The tattoo awfully reminds us of the toy Drake got her while dining at Ripley’s Aquarium in Toronto, which he rented just for the dinner. Check out Rihanna’s new tat above, and visit our gallery for candids of Rihanna leaving E11Even nightclub last night, of course with Drake. Posted by An.J / Filed under: News, Out Of Subject, Performances / Leave a comment? Ultimate-Rihannas.com is a site made by fans who do not make any profit of it, and spend free time on updating the site by choice. We do not own the rights to any of the posted photos found online, nor know who the author is. The site's purpose is for fans who want to be updated with the latest news. If you own any of the photos or articles on this website and do not wish to see them on it, contact us at staff@ultimate-rihannas.com and they will be taken down immediately.